– همکاران محترم می‌توانند برای سفارش تعداد از طریق تماس با دفتر فروش اقدام نمایند. If you’re a serious road warrior or you use your notebook for heavy-duty applications like photo and video editing, your notebook should have as much memory as possible. Adding a 4GB, 8GB, or 16GB laptop memory upgrade kit will allow you to multitask between more programs at once and load and edit larger files without having to wait for data to buffer to the drive. The latest laptop and notebook systems based on 4th Generation Intel Core processors require DDR3L memory powered at 1.35V. Vengeance 1.35V DDR3L SODIMM kits are compatible with the new 4th generation family of processors, and are backward compatible with 2nd and 3rd generation processors. 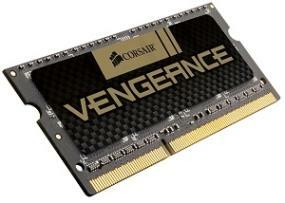 Vengeance memory is backward compatible with notebooks which use first-generation Intel Core i5 and Core i7 processors. Even if your notebook doesn’t use the latest-generation processor, you can still upgrade to 8GB using only two memory slots, and enjoy the confidence of Corsair’s renowned service and support. If you’re a gamer, a system builder, or just an all-around performance enthusiast, you should demand performance and reliability, regardless of your budget. 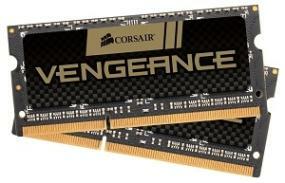 If you need dependable, overclockable memory at an attractive price, Vengeance is a great choice. Speed is nothing without stability. That’s why Vengeance DDR3 memory kits, like all Corsair memory products, are carefully screened and tested to exacting standards. Like the legendary Dominator, enthusiast-grade Vengeance DRAM is designed for stability, and stringently factory-tested. سلام. شما بعد از تحویل رم تا هفت روز زمان برای تست دارید. درصورتیکه رم به دستگاهتون نخوره بر میگردونید. اگر قطعه مشکل داشته باشه براتون تعویض میشه واگر کلا لپتاپ شما ساپورت نکنه پس گرفته میشه و مبلغ مرجوع میشه. من سرچ کردم و متوجه شدم که برای ارتقای لپ تاپم به رم از همین برند منتها مدل CMSX16GX3M2A1600C10 نیاز دارم که نوشته ولتاژ تست شده و SPD اون ۱٫۵ ولت هست ولی این رم که شما معرفی کردین مدل CMSX16GX3M2B1600C9 هست که توی توضیحات شرکتش نوشته با ولتاژ تست شده ۱٫۳۵ کار می کنه ولی کنارش نوشته SPD Voltage 1.35V / 1.5V هست ! سلام. رمهای با ولتاژ ۱.۳۵ را روی تمام لپتاپها میتونید بدون مشکل استفاده کنید. ولتاژ رم هست که سی پی یو میتونه پاسخ بده. رمها هرچقدر جدیدتر شدن ولتاژشون هم کاهش پیدا کرده تا روی سی پی یوهای جدیدتر یا قدیمی تر پاسخگویی داشته باشه.